Pin Point Alerts was established during 2010 and has grown to become Ireland's leading service provider for Alerts and Notifications services. the technology stack is extremely innovative and has won numerous awards over the years, both in Ireland and internationally. The original product developed by the company is called MapAlerterand this is a service used by many local authorities to issue service alerts across a number of channels. MapAlerter went live during 2011 with a large number of Irish local authorities and has a 100% client retention rate ever since. During 2012 the core technology that powers MapAlerter was tweaked and redeployed for Community Text Alert services. There are over 140 Text Alert groups across Ireland using the Pin Point service. Our Text Alert service receives wide praise from group managers because it is affordable, easy to use and is extremely reliable. It is fully integrated with over 40 Garda District headquarters across Ireland. Perhaps the best thing about our Community Text Alert offering is the high level of continuous innovation that is put into the development of the service. We work closely with all Gardai and all group managers to ensure that the Text Alert system exceeds current standards. During March 2015 we launched our dedicated Smartphone App for Community Text Alert to provides alerts to subscribers in an innovative manner that saves on running costs for each group. The company has continued to provide services to a range of new clients. We are very different to a bulk-texting company. Rather than relying on SMS Text Messaging we have moved with the times and all our services are delivered with multi-channel delivery options. In particular we are promoting the use of smartphone apps for Android and iOS where possible so that push notifications may be used instead of standard text messaging. The company also provides a range of custom services for clients who need a variety of alert services. For example, we provide notification services for Group Water Schemes and Sports Groups, amongst others. Our Text Alert service is used by the Kilkenny GAA Supporters Club and is responsible for their ongoing communications with all their members. The company was founded by Brendan Cunningham who is the Managing Director of Pin Point Alerts Ltd. Brendan's background is Geographical Information Systems and he has 10 years experience working in the Irish Public Sector before setting up Pin Point Alerts. Brendan is an ETL expert and is Ireland longest-serving certified FME professional, as accredited by SAFE Software. Congratulations to Wexford County Council - More Awards! Congratulations to Wexford County Council who were recently awarded by Chambers Ireland as the winner of the 2012 award for Best Local Government Technology Innovation for their use of MapAlerter.com! It's been a great year for Wexford Local Authorities who were awarded earlier this year for their use of MapAlerter.com at the eGovernment Awards. The success of MapAlerter.com is a combined effort from staff at Wexford Local Authorities and from the public within the county who have provided valuable feedback about the service during the year. Wexford County Council are now issusing alerts for a variety of topics such as Severe Weather Warnings, Flood Alerts, Road Works, Water Disruptions and many more. MapAlerter.com is fully integrated with FixYourStreet.ie (FYS). This service allows people in Ireland to make submissions to their Council for various incidents in their area such as Graffiti, Potholes, Street Lighting, etc. It's a great way for members of the public to submit incidents so Council staff can quickly take action. When you are submitting incidents on "Fix Your Street" it is possible to add location details (ie, map location), incident details/category, date of the incident and a brief description. At MapAlerter.com, our aim is to make the communications process between "government-and-citizen" as easy as possible. This is why we have integrated FixYourStreet.ie with MapAlerter.com so that our registered users can use their MapAlerter.com account to make submissions directly to FYS. Submissions can be made by logging into a MapAlerter account on a web browser or on the Smartphone App for MapAlerter. Therefore you no longer need to use a separate service in Fix Your Street: instead, simply log into your MapAlerter account and add your incident submissions directly from here. Our web form is easy to understand and is much quicker to complete than the standard submission form on FixYourStreet.ie. Also, it is worth noting that not all Councils are actively using FixYourStreet.ie. So our clever location-based technology can determine if your incident will be sent to a Council who is actually using the service. For example, why would you submit a Graffiti report to Cork County Council if they are not using the service? Our system intelligently picks out valid submissions and routes them accordingly. If you submit an incident report to an active FYS Council then we will forward it to them. If you submit an incident for a location that isn't part of an FYS Council then we will email you back and tell you about it. All in all, by submitting your FYS reports through MapAlerter.com we will manage your valid submissions and ensure that it will reach the correct Council as soon as possible. Meanwhile if your submission is for a non-FYS location then we will tell you about it and offer advice on how to proceed. Part of our service is to analyse the submission and quality check the information that is received. Anything that is invalid (eg, locations outside Ireland) will be rejected and the user that submitted the incident will be notified. Once a submission meets the standard of quality MapAlerter expects then it is forwarded to Fix Your Street as a standard submission. It takes about 5-10 minutes for MapAlerter to forward on valid submissions. A full email log is provided back to the MapAlerter informing them of the status of a submission. Once a submission passes then the user will be notified that the submission is now between themselves and the local authority. Once a submission fails then the reason(s) are emailed back to the MapAlerter user advising them to re-submit. MapAlerter is designed with scalability in mind and any updates with the Fix Your Street service will be matched in MapAlerter soon after. 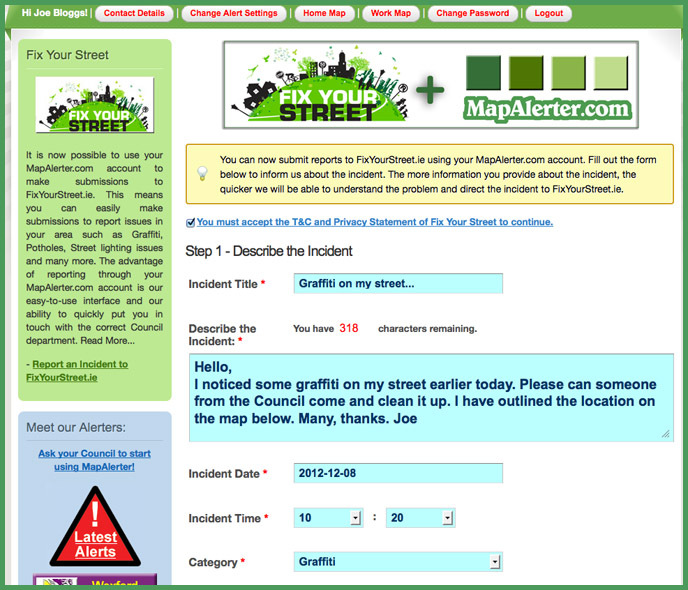 If new categories are added to Fix Your Street then they will quickly become available in MapAlerter without any delay. Like all MapAlerter services, there is no charge for any user to make Fix Your Street submissions. It is free for any member of public to create a MapAlerter account and receive alerts or make Fix Your Street submissions. Pin Point Alerts are keen to partner with local Web, IT and GIS companies to distribute MapAlerter to international markets. The company is particularly keen to explore partnership opportunities across Europe. Get in touch if your company is keen to act as a regional distributor of MapAlerter services. There are many attractive benefits for partnering with Pin Point Alerts Ltd to promote MapAlerter for international markets. An attractive revenue share agreement exists between both companies. Marketing and localization services are typically provided by the partner company while Pin Point Alerts provide all technical, development and support services. Pin Point Alerts Ltd retain all intellectual property for MapAlerter services. The partner company must have a history of trading with at least 3 local authority portfolio clients that have existed for long term projects or service level agreements. The prospective partnership company should have the correct legal status for its jurisdiction (eg, Ltd, GmbH, etc). The affiliate company should have at least one project manager or client relationship manager that is a fluent English speaker. This person should be the sole nominated point of contact for any business relationship. A video interview will be conducted with prospective business contacts. CVs of all staff working as part of a MapAlerter business relationship should be provided to Pin Point Alerts Ltd along with LinkedIn profiles. This includes project management, sales and technical staff. A Tax Clearance certificate along with a current set of company financial statements should be made available to Pin Point Alerts. Details of in-house developed products or details of 3rd party products in similar partnership agreements should be made available to Pin Point Alerts. Pin Point Alerts will assess partnership requests on a case by case basis. Any additional information that you feel will assist your application should also be presented. Arrange a Partnership Consultation with Pin Point Alerts Ltd.
You can email any proposals to "partnerships @ pinpointalerts.com" and you will receive a response shortly afterwards. MapAlerter has a dedicated smartphone App for Androidand iOS. This is intended to reduce a Council's spend on SMS text messaging where prices are controlled by the phone networks. By encouraging subscribers to install the App it means that MapAlerter is an extremely cost-effective service for all local authorities and push notifications can be used instead of text messaging in many cases. MapAlerter.com is the cloud service used by many local authorities. This is branded as a MapAlerter themed application. However some local authorities (Corkand Fingal) have opted for fully customized white-labelled solutions of MapAlerter where the branding is identical to their own CMS/Website. The white-labelled offering means Councils can operate an alerts service with a consistent corporate brand. We recently showcased MapAlerter at the recent AGI conference in Nottingham. The aim of the presentation was to bring attention to our MapAlerter.com service and the impending launch of MapAlerter.co.uk. Our slide deck is included below. If you are interested in using MapAlerter or a white-labelled equivalent for your government agency then please get in toucb and we can talk you through the process. It is quick to clone and re-deploy MapAlerter for any agency (government, utility companies, flood alert agencies) and we would be delighted to provide you with our technology. Pin Point Alerts have developed an innovative service called iVOTER that allows candidates to communicate with potential voters during election campaigns. This is a free smartphone app for Android and iOS platforms that can present a candidate's mandate as well as allow the candidate to communicate with prospective voters using push notification alerts. Candidates have the ability to issue notifications to voters right up to polling day so there are no restrictions with any moratoriums. iVOTER offers a modern and cost-effective way for candidates to communicate with voters. The idea for iVOTER came about after a recent election where we noticed how many campaign flyers came through our door. What was more appraent was how many of us completely ignored them. Eventually when polling day came around none of us really knew much about our candidates. By ignoring each candidate's flyer we had no idea about policies, history or voting record. So we decided there should be an "App for that" and iVOTER was born. The iVOTER technology also acts as a leading Polling and Surveying tool during election campaigns. Submissions from App users are anonymised, aggregated and made available to 3rd parties. A mock election feature also exists at a constituency level which also generates useful user metrics on the app. This is an especially useful feature for local media agencies looking for local polling results rather than regional or national results from bigger polling companies. iVOTER will be available for all elections in the UK General Election, 2015. This includes England, Northern Ireland, Scotland and Wales. If you are a candidate looking to boost your profile to younger voters using the iVOTER App then get in touch and we can upload your profile to the app. iVOTER is built on extremely scalable technology and will be available for many elections around the world from 2015 onwards. This includes internal party elections in the USA such as primaries and other candidate selection races. iVOTER app users can quickly drill into their own constituency. This makes it extremely easy to locate their candidates and learn about them. So when candidates wish to issue push notifications to prospective voters it means that iVOTER knows exactly who should receive your messages. iVOTER is available for all Android devices from Version 4 and above. it is available for all iOS devices running version 7 and above. iVOTER ios optimized for tablets and smartphones. The tablet version resembles a ballot paper and receives wide praise from users in terms of the overall user experience. We encourage all candidates running for elected office to consider office. The push notifications for iVOTER make it a far superior to communicate with voters. With Android and iOS accounting for 98% of the smartphone market it means that iVOTER reaches the majority of your audience, particularly younger voters who may never read your printed flyer that was costly to produce. MapAlerter.com is a free service that allows people to receive various alerts about their Home and Work locations. Our service is used by County Councils and other government agencies who wish to quickly communicate with local people using text messages, email, phone call and other modern techniques such as Twitter and RSS Feeds. It is very easy to sign up for the service. All we need are your basic address details and we will determine your location from here. Once your County Council issues an alert on our mapping system, we will figure out if you should receive it or not. If an alert is submitted for your area then you will receive a text message and Email almost instantly. You may also receive a phone call for emergency alerts! MapAlerter.com operates using a series of calculations to determine who should receive text messages when a service disruption occurs. Our unique technology combines a series of tasks to filter people living in affected areas and to inform them with details of the disruption by way of email and SMS message. MapAlerter.com has been included in the list of nominees for Clickatell'™s SMS 2011 Personalized Priority Messaging Awards! Clickatell are our excellent SMS service provider who ensure that we deliver all our alerts on schedule to the correct targets. We are delighted that we have reached this stage of the voting. Hopefully we will win this award to mark the recent successes of MapAlerter.com, especially at Wexford Local Authorities. Apart from the creation of "flat file" formats (eg MapInfo TAB, ESRI Shapefile or Google KML), we deliver open data solutions using more complex databases where dynamic SQL querying is required through a web API request. Therefore you may have your data stored neatly in a MySQL, Oracle or SQL Server table while end users can access it from a simple web URL request! This is our answer to a Web API and we have a demo of this available at https://api.mapalerter.com where we illustrate how you can query Donegal County Council's planning database from the URL. Open Data is a phrase used in everyone's vocabulary these days, and rightly so. Opening up data allows for interaction with 3rd party developers who may even better use your data for other web and mobile applications. In the case of the Donegal example, that data can be used for mobile applications instantly. If your government agency wants to open up your data then get in touch. We know all the FME methods to translate our data and our web API is available to you if you want something like the example on our Open Data site. If you want to modify the examples published, then we will be happy to edit our source code to match your desired queries! It is with great pleasure that we announce Roscommon County Council as the latest Council to join MapAlerter.com! Roscommon have joined MapAlerter.com in advance of any potential severe weather period this Winter. We look forward to delivering location based service alerts to people in Roscommon using SMS, Email, Phone Call, Tweets and RSS! MapAlerter is the name given to the Local Authority Alert service provided by Pin Point Alerts. This news category will keep you up to date on all things MapAlerter including service updates, new feature development, outstanding achievements, case studies and much more. Alerts "beep in" like normal text messages and appear in a list structure. It is possible to share alerts with others using common social media, email and SMS links. Full information on any alert will appear by tapping the "View Details" button for any alert. Each alert includes a lot of information include category information graphics and the alert date. A web map also appears to illustrate the extents of any given alert. Full alert text information appears underneath the map. The App is designed with simplicity in mind and there are a small number of clear buttons used for navigating the App from the main menu. MapAlerter users can decide what alert categories interest them and can switch off any categories that do not interest them at the tap of a button. Location is the key to MapAlerter's success and users can quickly define Home and Work location points through the App. The GPS feature of the smartphone is enabled to ensure that a user is quickly centred on their current location as a useful starting location. It is simply a case of dragging the red icon to customize the user's location. Arrange a demo of the MapAlerter App on your smartphone. MapAlerter is provided as a cloud service at the www.mapalerter.com domain. This is styled distinctively using a MapAlerter theme and does not include any unique branding for any specific local authority. However it is possible to use the white-labelled MapAlerter service to ensure that MapAlerter is deployed at your organisation with your CSS and style templates. For white-labelled MapAlerter deployments the Council decides what categories are visible and utilised. If your Council does not use "Flood Alerts", for example, then this category can be completely disabled. However on MapAlerter.com all categories are visible. Custom development can be carried out on white-labelled solutions to suit the individual needs of each Council. Custom development may not always be possible on MapAlerter.com. Email alerts delivered from white-labelled solutions are also fully branded and styled for each Council. A Vanity URL also is possible. For example if you want to maintain a "corkcoco.ie" address then this can be set up. Cork's URL is http://mapalerts.corkcoco.ie.